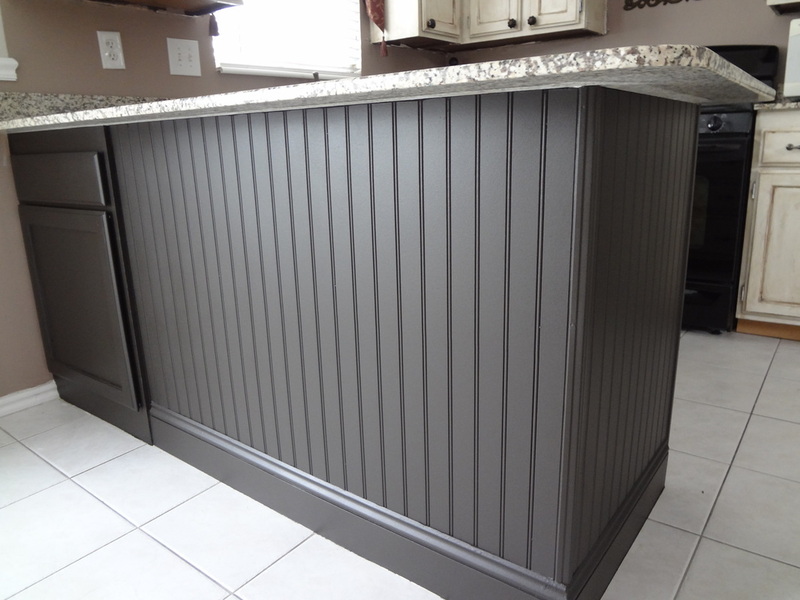 How to add Bead board to your kitchen island! Our friend Whitney was ready for an updated look in her kitchen. She had painted and refinished her cupboards and did a great job! Now she wanted her island to get a facelift along with her dining room chairs and tables so she called us for help. Here is what it looked like before. 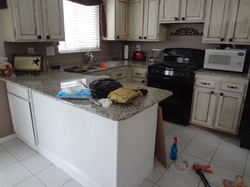 First we came in and removed the corner pieces from the island. 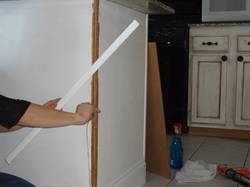 We took a razor blade and removed all of the old caulk around the baseboards and corner strips. Then we took 150 grit sand paper and roughed up the baseboards and cupboard door, removing any old dripped paint and smoothing them out so the paint would apply smoothly. We unscrewed the cupboard door to take home and paint. We wiped everything down, got rid of all the dust and anything that could get into the paint. Make sure everything is super clean. The prep work is key to a beautiful finish. We took exact measurements to fit the bead board and corner strips to both sides of the island. We went to HomeDepot, and had an employee cut the pieces for us (so awesome they do that for you). 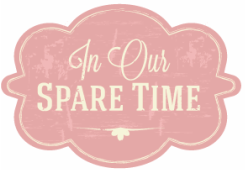 We purchased caulk, liquid nail glue, and paint at this time. We painted the bead board and cupboard door before we brought it back to her house so we could get into all the grooves without overspray. We used a dark chocolate brown flat paint that almost looked black (flat paint dries so fast). We applied two coats and were ready to finish our project. The next morning we fit the bead board to the island. You want it to be a tight fit with gapping no more than 1/4" on each of the sides. You want the top and bottom to be tight. We had to shave the top of our bead board a little bit with a razor blade because the island did not sit perfectly square. No big deal, just shave where needed then sand so it is smooth again. 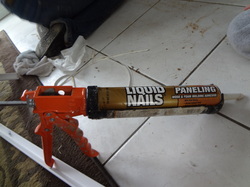 Once we measured, we were ready to apply the liquid nails. We applied a nice amount all over and then stuck it to the island. We then pulled it off, applied a little more then stuck it back up again. This created a suction and it stuck better (follow instructions on the tube). Once the bead board was on in the right place we hammered small finishing nails in to the grooves so the board will never pop off. We hammered 3 down each of the sides and 3 down the middle. (Make sure you get them into the groove so they are not seen). 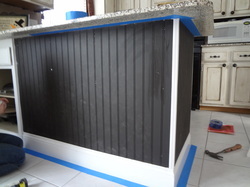 When both sides were on and nailed, we placed new corner strips that overlapped just slightly onto the bead board. We filled the corner strips with liquid nails and then nailed it into place with the same finishing nails. Be sure to caulk the nail holes in the corner pieces and wipe so they are hidden. 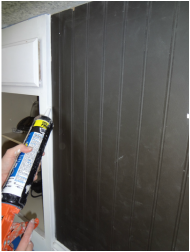 When you apply a thin line of caulk, wet your finger and wipe down the caulk to make it smooth. Now that everything is caulked, you need to tape off the floor, walls, and under the counter so you don't get over spray. We also laid some sheets across the floor and taped some on the wall. 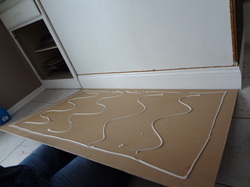 If you don't have a paint gun, then use the white foam cabinet rollers to paint. You are ready to paint! Apply your first coat spraying or rolling in the same direction at all times so the paint is uniformed. If your house is warm and you use flat paint, it will dry quick! Apply your secon coat once the paint is dry. Let dry, remove tape, wipe up any over spray and you are all finished!! WOOHOO! What a gorgeous transformation! You can do it!